The Energy, Processes and Utilities industry is not just getting more complex and costly, it’s getting more competitive too. The profitably of established businesses is being challenged by accelerating commoditization eroding their legacy of competitive advantage. These days, if you can’t compete on price as well as quality and expertise, you’re out of the running. Which means that companies involved in, for example, product development and specialty chemicals are being challenged by a highly competitive a market that never stops investing in science and new technology. This competitive pressure is being felt right across the industry. Companies hungry to win new projects face expanding costs from a specialized workforce that’s shrinking as many hit retirement age, plus the need to operate more complicated processes and create more involved designs. The multi-tasking owner-operators of complex facilities are also feeling the pressure. They need to handle the proper maintenance of their assets, invest for long term operations, manage procurement strategies and deliver ROIs set by over-optimistic boards in an environment where the challenges and expectations are always changing. Faced with these mounting, multifaceted challenges, how is it possible to ramp up competitive advantage? To increase margin and profit organizations have got to – in the simplest terms – ‘do more better and for less’. In reality, that means increasing quality and productivity while reducing non-value adding activities and compliance risk. The answer is ‘innovation’. Innovation isn’t only about having ‘the big idea’ and creating brand new product lines, revenue streams and markets. It’s about taking existing processes and making them simpler, quicker and more efficient. That means reducing time spent on repetitive tasks, avoiding duplication by improving organizational and infrastructure processes, and speeding up R&D to quicken the pace of innovation and diversify into new ventures. Virtual testing can reduce the number of experiments by 40%. Time spent on tracking samples is decreased by 90%. The result? A 66% acceleration in R&D. Innovation is also about improving the way individuals work together. By making sure relevant real-time information is available to all project stakeholders – from the remotest field engineer to the director of manufacturing at head office. That way everyone can collaborate both vertically across the boundaries of functions, departments, organizations and geography, as well as horizontally, weaving a digital thread throughout the lifecycle of their projects, from fundamental research to industrialization. Then they can freely – yet securely – capitalize on knowledge and know-how by sharing and building on their ideas and expertise, bringing together data from different sources in intelligent ways to reveal yet undreamt of formulas, designs and methodologies. “Once the information exists only once for the entire organization and its ecosystem, different people in different job roles can collaborate in real time without risks of using non-applicable information. To achieve all the above, an organization needs to establish a scalable business platform connecting people across disciplines, processes and related organizations, such as suppliers. A platform that connects the virtual and real worlds, allowing a global business to re-imagine its engineering and operations while planning for excellence. Nothing beats the real-world experience of our customers – especially when they’ve achieved something they never thought possible in such a short space of time. Which is why we would like to introduce two very different businesses and let them explain how they have reaped the very real rewards of 3DEXPERIENCE® platform. The 3DEXPERIENCE platform is perfect for improving product design expression, quality and efficiency while optimizing engineering costs. They clearly chose the right solution. Not only did 3DEXPERIENCE® revolutionize their design and engineering, it also enabled key stakeholders throughout the firm to collaborate in real-time through a single information source. A true game-changer for the company. Read now the full case study. The visualization now possible with simulation allows you to do the interpretation—to spot either opportunities or flaws—a lot earlier. This impacts and affects the here and now much more so than ever before. So, in the upstream business, visualization is a great aid, able to bring folks together with disparate types of information analyses and data to solve some very tough challenges. 3DEXPERIENCE’s 3D visualization and advanced simulation technology played a fundamental role in helping them overcome key drilling, completion and production challenges. In fact, we would join ExxonMobil in saying 3DEXPERIENCE tools have played a vital role in the success of the energy industry at large. Our brains are tuned to work in 3D […] When we look at an excel spreadsheet, … [or] …, a word document, for us to visualize … an image it is very difficult. But put all that information in a 3D Platform, […] in a digital model, […] you can visualize how liquids are flowing through a pipe, you can visualize how data is being generated from a compressor. New generation capital projects demand sustainable and innovative approaches to achieve ‘zero-defect’ design and engineering that is construction and operation-ready. 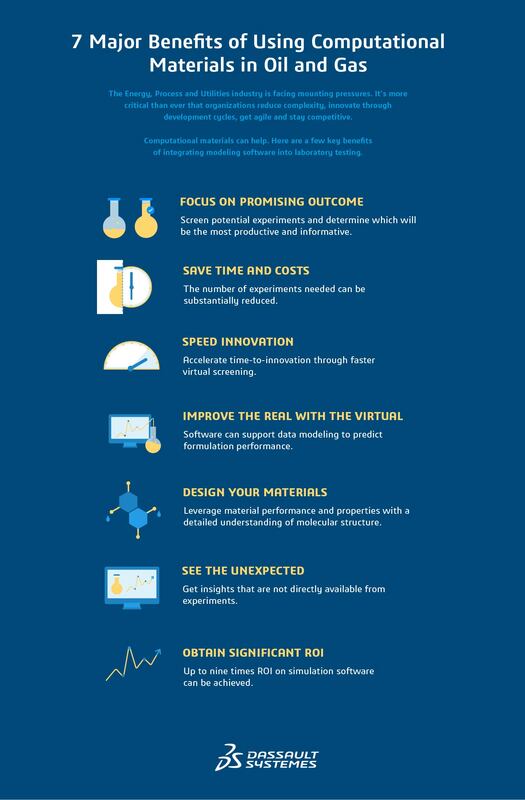 With the latest virtual tools to develop, test and refine their model ideas, innovation is never slowed by the costly introduction of flawed designs and processes when applied in the real world. In the virtual world we can develop, simulate and test everything to the limit – exploring the real-world behaviour of products and nature itself. Here we can afford to make mistakes before they become a reality. This applies to simulations at all scales from a molecular level for materials to a systems level for entire buildings. This saves time, money and materials – helping to create economically sustainable companies with less wasteful, more environmentally sustainable, processes. Better still, we can make collaboration not just possible, but extremely sophisticated – like testing a dam’s ability to resist an earthquake. We can also make the difficult easy, simulating complex and novel plant processes before they are put in place. And we can make the dangerous safe, such as seeing how a volatile chemical will react in multiple scenarios. It reduces the time it takes to construct a nuclear unit from 58 to 48 months. It has also reduced engineering and operator hours by 25% during commissioning. It saved $5-10M per reactor in data collection and transfer during handover. Reduced accidents by 50% – thanks to the sharing of higher quality, less ambiguous information between fieldworkers. Visibility is key to profitable innovation. Everybody is sharing the same information, everybody can see what is – and what isn’t – going well and everybody can also see how change those things for the better. Because, in the end, it’s all about how we work together as teams. Which is why improving innovation and operational efficiency requires consideration of the human as well as the technological. Management must leverage their human capital because innovation inevitably requires shifts in corporate culture. It requires agility, faster decision-making and project cycles. Becoming a digitalized organization impacts the type of work that teams do and how they work together. There will be pressure to achieve results more quickly. New skills and knowledge will be required. And a new mindset. For innovation to succeed everyone in the organization needs to adopt an ‘owner mindset’. To take responsibility and think like the customer. That way we can ensure that everyone within the business embraces the principles, platforms, supportive apps and technologies that deliver digital continuity in everything we do. That’s how we’ll get an edge on the competition. That’s how we’ll win.